Lipase-catalyzed kinetic resolution of racemates is considered to be one of the most fascinating topics in asymmetric catalysis. This review focuses on some of the recent developments in this rapidly growing field demonstrating the versatility of the method in the resolution of racemates. The literature search is dated back to the last five years and covers some comprehensive examples. 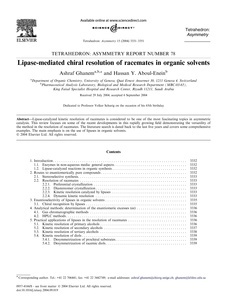 The main emphasis is on the use of lipases in organic solvents.